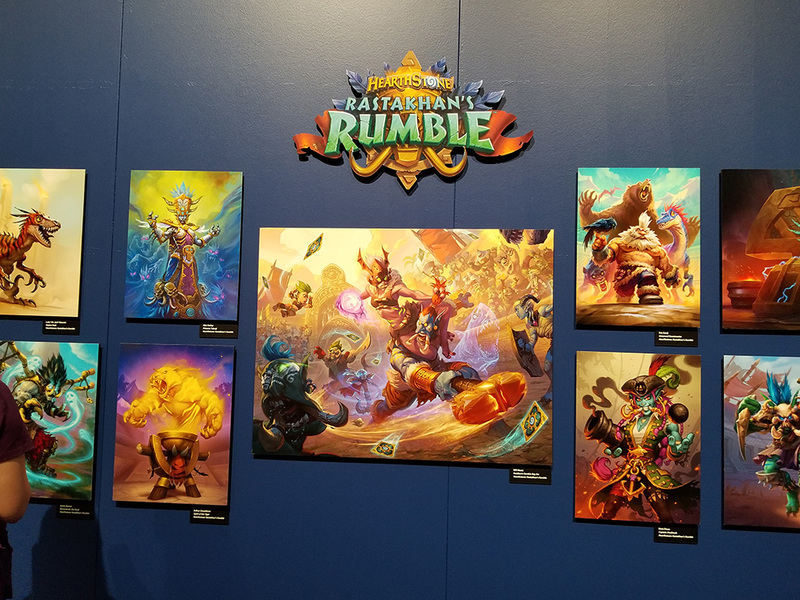 Rastakhan’s Rumble, the latest Hearthstone expansion is here and llllllllllet’s get rrrrrready to — wait, that’s a copyrighted phrase? Let’s stop and not get sued. The long awaited Troll expansion takes us to the jungles of Stranglethorn and Gurubashi Arena. Even if you didn’t pre-order, if you’ve followed my handy dandy guide, you should be sitting on about 5,000 gold and some dust left over from the Boomsday Project. Bust open those packs and get yourself some cards! As I’ve done with previous expansions, I’ve gathered some interesting deck concepts to try out in the early days of the expansion. These might be great ideas, but I’d temper expectations. Most won’t necessarily be meta decks which will rocket you up the ladder. With this being the third and final expansion of the year, you’ll see some tweaks to existing decks as well as some brand new decks. Before we get into the deck lists, remember that you don’t need to have every card in a deck list to make it work. Unless you spent a bunch of real life currency or have a huge bank of dust, you’re not going to have all the cards you need the first few weeks of an expansion. I strongly recommend you do not craft anything the first two weeks while the meta settles out and the community determines the true powerhouses. As long as you have the core, defining cards, you can find good substitutes for most of the others — and some deck lists helpfully suggest substitutions. I get the impression someone on the team likes OTK (one turn kill) decks. Witchwood brought us Shudderwock, and Boomsday Project introduced Mecha’thun decks for Druid, Rogue, and Warlock, as well as Malygos Druid and Velen Priest. 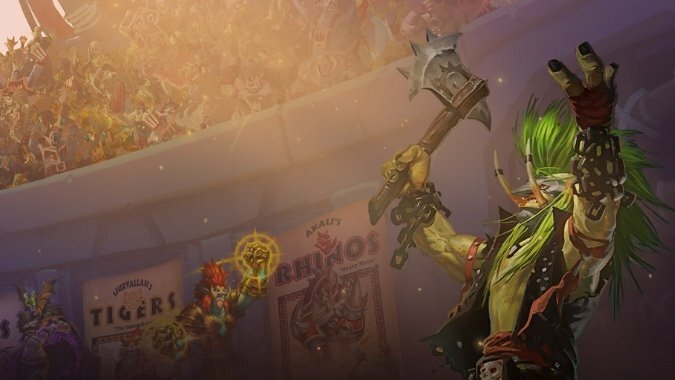 These decks remain a threat to any slower deck without taking a single card from Rastakhan’s Rumble. Now let’s get to the decks. Druid should still have Token, Toggwaggle, and Malygos variants from Boomsday. This version of Malygos Druid swaps in a whopping two cards from Rastakhan’s Rumble. 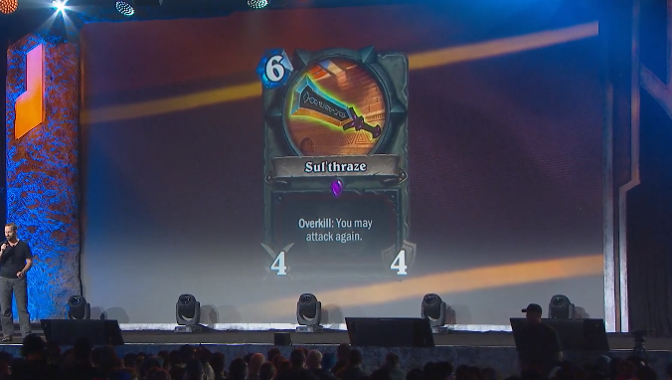 One of the new concepts in Rastakhan’s Rumble is using the Druid hero to attack. Spirit of the Raptor provides card draw along with Nourish. Cards like Gnash, Bite and Claw augment the Druid hero’s attack. Savage Striker gives a bit of reach, and Gonk, the Raptor helps you to clear enemy boards. A strategy based on ramming your face into things may sound dicey at first — unless, of course, its your opponents face, and you’re also buffing up some Hench-Clan Thug. This variant takes the same basic idea, but pairs it with the power of Druid tokens and Savage Roar. This gives the deck a powerful finisher. Spell/Secret Hunter is already a fun tempo deck, and Deathstalker Rexxar ensures it never runs out of resources. The deck gets a single addition from Rastakhan’s Rumble, but what a card it is. Apparently, Zul’jin‘s been hanging out with da Old gods because he enters into Hearthstone bringing back the Yogg-Saron effect from Whispers of the Old gods. Deathrattle Hunter aka Egg Hunter is another strong deck from Boomsday Project which gets two additions in Rastakhan’s. Da Undatakah can give you even more Devilsaurs, while Oondasta can cheat out your face protecting Witchwood Grizzlies. By fire be purged! Rastakhan’s provides some strong elemental support and none stronger than summoning the Firelord himself with Jan’alai, the Dragonhawk. This deck is Journey to Un’Goro’s last hurrah as many of the elemental cards come from that expansion. Frost Lich Jaina provides stabilization and healing. Nothing like Ragnaros‘ fireballs healing your face for 8 a turn. The big question for Paladin players is what effect if any will Rastakhan’s Rumble have on the powerhouse of Odd Paladin. But even if it does weaken Odd Paladin, there are other options. One hope I had for Rastakhan’s Rumble was it would give support to some of the lesser played Quest cards which are going to rotate in the spring. 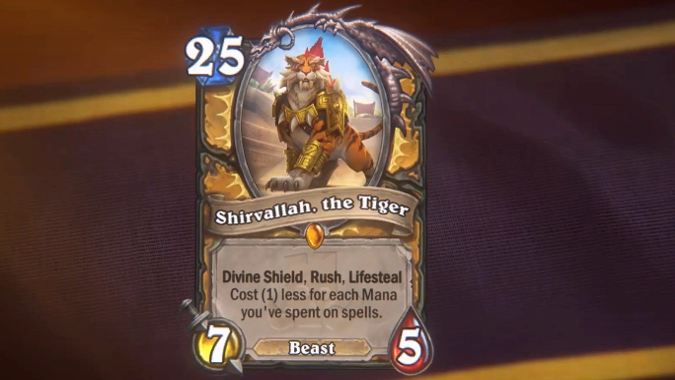 Paladin’s quest, The Last Kaleidosaur, looks to have received that help with Shirvallah, the Tiger. This deck uses Hakkar, the Soulflayer to spawn Corrupted Blood into each players deck. In addition to some strong healing, this deck pulls a trump card in Prince Liam to ‘cleanse’ the Paladin deck from Corrupted Blood. This decks aims at the combo decks that prioritize draw. They’ll draw Corrupted Bloods, killing them, and delaying their combo pieces. It seems like every expansion Dragon Priest finds a way. This time its aided and abetted by Zandalari’s own Talanji and the Spirit of the Dead. With all the deathrattles, you might even be able to work in the Awaken the Makers Quest card. I thought I had seen everything with Murloc Paladin. I was wrong. I would have never thought about Murlocs in Priest, but they seem an ideal tribe to hit with Surrender to Madness. Bwonsamdi, the Dead and Murloc Tastyfin takes care of all your draw needs. Aggro and Priest don’t normally go together, but here we are. Prepare all your Jack Sparrow lines! Pirates are back in a big way in Rogue. 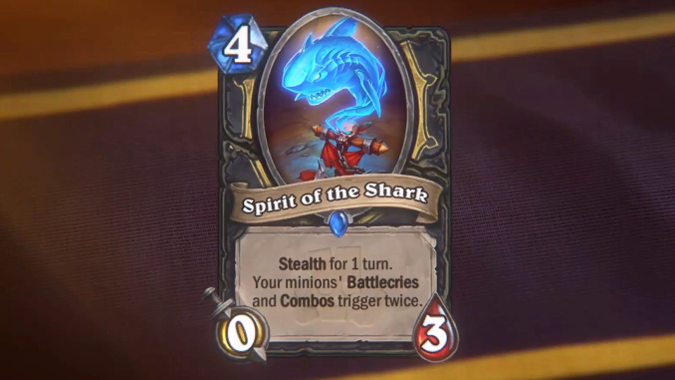 Bloodsail Howler, Sharkfin Fan, and Ticket Scalper join Captain Hooktusk. This aggro deck pressures a mid range or control deck into pure survival mode. Mojomaster Zihi limits counterplay while Cannon Barrage gives it a combo like finisher. Everyone is excited about pirates, but this deck goes the Jaws route and builds around Gral, the Shark and Spirit of the Shark. Cheap spells serve as early removal as well as combo activators. I might go with Leeroy instead of Alexstraza. There’s a spell slinging theme to many of Shaman’s Rumble cards. The Spirit of the Frog gives you a powerful and somewhat predictable draw engine. The spell damage totem, plus plenty of spell damage minions, including the big guy Malygos himself, make your spells hit all that much harder. You’ve got to get a little lucky for Far Sight to hit on Malygos to get a true OTK. With Krag’wa, the Frog, its more of a set up and then kill. Even and Zoo should still be solid decks in Rumble. I originally called this Discord Lock. You see where my brain has been today. Like Paladin’s The Last Kaleidosaur, Rumble gives support to the underplayed Warlock quest, Lakkari Sacrifice. Reckless Diretroll provides yet another discard option. Like Clutchmother Zavas, High Priestess Jeklik rewards you for discarding it. Soulwarden helps with all the resources you burn to fulfill the quest. Once the quest is done it can be difficult for your opponent to deal with. It’s sort of a lesser version of thrice nerfed The Cavern’s Below. This deck aims to frustrate combo and OTK decks. Between Demonic Project, Gnomeferatu, and Void Contract, you’ve got a decent chance to wreck your opponents ability to pull off his combo. If none of that works. Rin, the First Disciple can finish the job. I have no idea how viable this will be, but just imagining the look on the Shudderwok’s player face when Void Contract goes off might be worth it. Rush was a new keyword in the Witchwood and thus far it seems to have the most synergy with Warrior. With the Rumble cards, it’ll be like Tom Sawyer driving a Red Barchetta Closer to the Heart. Spirit of the Rhino and Sul’thraze helps you control the board. Akali, the Rhino is draw plus a buff. The win condition becomes Oondasta to pull your Charged Devilsaur. Rumble brings dragon support to Warrior for the first time in Hearthstone. Smolderthorn Lancer provides a power conditional removal. You’ve got lots of AoE to deal with swarm decks and ways to gain armor. Then you’ll set up a big finish from your Crowd Roasters. What if I want to play something else? If you’re looking to build a deck around a specific card or Legendary you’ve opened, Heathpwn’s deck finder tool can help. You put in the card you want to build the deck around in the Contains field, then hit Filter. Heathpwn will return a list of user-made decks with that card in them. Look over the decks with the most upvotes and comments, then try one out. What are you having fun and/or success with on the ladder?